You are sitting at home, watching your favorite television series, when a commercial comes on. The newscaster dramatically announces, “This silent but deadly killer could be in your home right now, find out what it is at 11!” Though you planned to go to sleep after the show, you anxiously stay awake to find out about the deadly killer. The newscaster announces the killer is radon and instead of answering your question, you find yourself left with more questions. “Of all the potential problems in a home, radon is one of the easiest to identify and fix,” says Dwayne Boggs of Boggs Inspection Services. Below, Boggs answers your questions about this hazard that can be anywhere. Radon is an odorless, tasteless, colorless gas. It’s a radioactive gas created from natural deposits of uranium and radium in the soil. When radon leaks into homes, it has to potential to accumulate and build up to unsafe levels. Radon has been shown to be a cause of preventable lung cancer. Major health organizations like the Centers for Disease Control and Prevention, the American Lung Association and the American Medical Association agree that concerns about radon should be taken seriously. What Homes may be Affected? Any home can be affected by radon. Many dangers to a home are common through the whole neighborhood. If your neighbor’s house is in a floodplain, it is a good chance your house is too. Or if your neighbor has a problem with subterranean termites, you would want to keep an eye out for the little buggers as well. The same is not true for radon. Every single house carries its own individual risk. Every other house in your neighborhood can test okay for radon, and yours could be the only one affected. Or the opposite. Radon can be a problem in homes of all types: old homes, new homes, drafty homes, insulated homes, homes with basements, and homes without basements. Local geology, construction materials, and how the home was built are among the factors that can affect radon levels in homes. There are several types of tests for radon. The short-term test usually takes between 2 and 7 days—a radon test should never take less than 48 hours. Short-term tests are placed in the lowest livable area of a home. “The test can provide a snapshot of radon activity during the testing period,” says Boggs. However, a short-term test cannot provide a year-round average. Instructions for performing the test should be followed carefully. Ideally, tests should be placed by a qualified professional. Long-term tests take a minimum of 91 days, and can account for seasonal changes that affect radon accumulation in the home. They are most often done if a short-term test comes back with elevated levels. Like short-term tests, they should be placed in the lowest livable area of the home and should be performed by a qualified professional. Radon tests can also be performed on water, but radon entering a house through water is usually only a concern if the home is on well water, not on municipal water sources. Radon entering a home in the plumbing is a much smaller concern, and a qualified professional can evaluate the need for water tests. The good news is that proper radon mitigation (sometimes called radon remediation) is a relatively small fix with low maintenance and upkeep costs. “Most homes can be fixed for about the same cost as other common home repairs,” says Boggs. Radon mitigation should always be performed by trained professionals. The process often involves simple steps, like patching holes and cracks in the home’s foundation. Other parts of the mitigation process are more complicated, which may involve the installation of specialized mitigation equipment to redirect the radon out of the house and prevent it from building to unsafe levels. After a home is identified as having elevated levels of radon, it should be retested after radon mitigation and every two years to ensure that the mitigation is properly managing radon levels. Radon is a concern that people should take seriously, but it can be managed safely and effectively. If you are purchasing a new home, ask to perform a short-term radon test as part of the inspection process. If you haven’t had the home you live in tested for radon, consider having it tested. The EPA website with more information about radon. 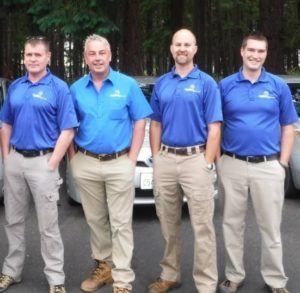 To get advice about radon testing, radon mitigation services in the area or to schedule an inspection of your home to look for areas where your home might need attention, visit the Boggs Inspection Services website or call 360-480-9602.